Hello Friends, West Central Railway has released notification for recruiting aspirants on Apprentice Vacancies. 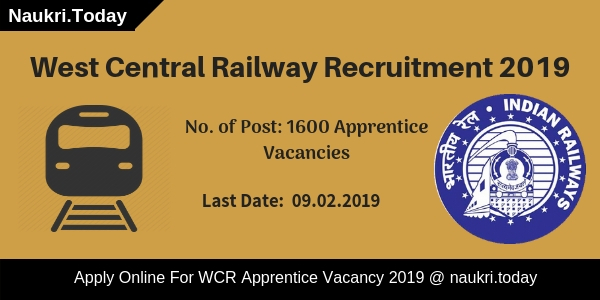 There is 1600 vacancies are available for West Central Railway Recruitment 2019. Candidates who have 10th Pass certificate with a minimum 50% may apply online for Apprentice Posts. The Online Registration has been started from 01 February 2019. Interested and Eligible applicants may fill up their application form before the Last date 09 February 2019. Candidates have to pay Rs. 170/- as an application fee for WCR Apprentice Vacancy 2019. For further more information candidates may refer to the below article. Fresh update as on 09.02.2019: Dear participants, Today is the last date of online registration for West Central Railway Recruitment 2019. 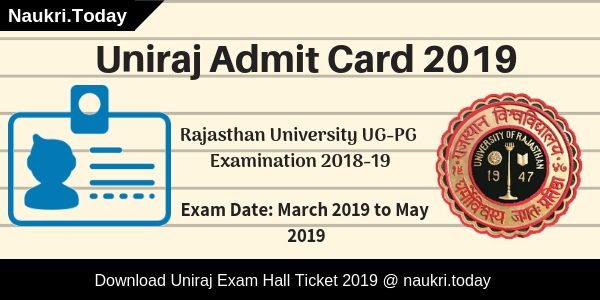 Candidates may check here eligibility criteria before applying. Interested participants must fill up their application form for WCR Vacancy 2019 as early as possible. Here we gave you links to apply for West Central Railway Jobs 2019. Form Where We Can Register Online For West Central Railway Bharti 2019? What Is The Last Date For Editing WCR Online Application Form? How I Apply Online Form For West Central Railway Recruitment 2016 – 17 ? Trade Name Welder, Electrician, Wireman, etc. The Department has released vacancies in west central railway, Bhopal, Madhya Pradesh. For online registration, candidates need to log in mponline website. The Department has published notification at the Madhya Pradesh Online WCR Apprentice Jobs 2019. 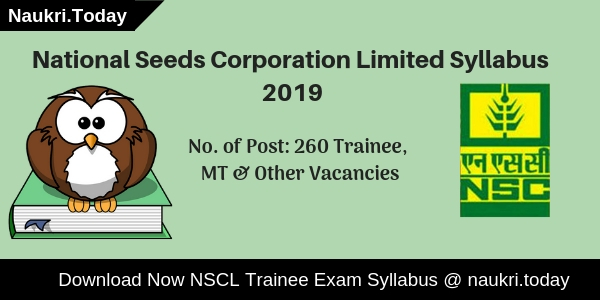 Here we provided you links to apply for WCR Vacancy 2019 for Apprentice Posts. For more details candidates must read official WCR Notification 2019. Candidates may download official notification form links given here. Candidates must note that the department do not provided any time period for editing or doing correction in an application for West Central Railway Recruitment 2019. So Participants must fill up their application form carefully and must recheck all the information mentioned in it. Log on To The Official Website of West Central Railway i.e wcr.indianrailway.gov.in. After that search for recruitment section at Homepage. Now open WCR Apprentice Vacancy Notification PDF and Read it Carefully. After that candidates should pay their application fee through online mode. Now Click on Submit Button to Save West Central Railway Vacancy online form.. Conclusion: West Central Railway Department is going to appoint candidates on 1600 Apprentice Vacancies. Candidates may fill up their application form before the last date for West Central Railway Recruitment 2019. For more information candidates may refer to the above notification. Are you seeking jobs in West Central Railway ? Then, you must have heard about West Central Railway Recruitment 2017 notification pdf. So, here we are with all the details related to RRC Bhopal Vacancy 2017. In the past few days, West Central Railway has released a notification for filling up total 345 vacant posts. The participants who are interested for RRC WCR Jobs 2017 can apply for various positions like fitter, Electrician, Welder, Electrician Mechanic and other posts. Candidates who are interested to fill application form for West Central Railway Vacancy can apply through online mode. The last date to submit the completely filled application form latest by 20th December 2017. West Central Railway has published West Central Railway Recruitment 2017 advertisement on its official website. Interested applicants can fill application form for RRC Apprentice Vacancy now from here. Those who have not applied yet can apply now as the registration process is going on. The participants will get all the details like eligibility criteria, pay scale, selection process, application fee etc. You will also find the direct official links to Apply Online and download the notification pdf for West Central Railway Vacancy 2017 – 18. The applicants who are interested to apply for RRC Bhopal Vacancy should have passed 10th standard or equivalent from a recognized board. Candidates will get the detailed information regarding the education qualification required for WCR Fitter Jobs 2017. Candidates who will be applying for WCR Apprentice Jobs should be maximum 24 years old and minimum 15 years old. The applicants who are applying for West Central Railway Recruitment 2017 will get the age relaxation in upper age limit. Participants belonging to SC/ST category will get the age relaxation of 5 years and 3 years in case of OBC Category contenders. Participants who will be filling application form for RRC Bhopal Vacancy need to pay the application fee. The applicants need to pay Rs. 182.60 as registration fee for WCR Fitter Jobs 2017 – 18. The payment of the application fee will be through online mode. West Central Railway is inviting online application for total 345 Apprentice posts in the department. Contenders will be selected on the basis of merit list prepared by the department through the marks scored by the candidates in 10th and 10+2 standard. The applicants who want to check the detailed information can refer the official notification pdf, we are providing the direct links to fill the application for WCR Fitter Vacancy links in end. First of all, visit the official portal i.e. wr.indianrailaways.gov.in. Then, search for “West Central Railway Recruitment 2017” notification pdf. If you are eligible and interested can click on Apply Online Link. Then, fill all the details correctly in the application form for RRB Bhopal Jobs. Now, upload your scanned photo and signature and other required documents. Then, the recheck all the details again and pay the application fee if required. Conclusion : West Central Railway Recruitment 2017 notification for total 345 vacant posts is released on its official website. The applicants who are interested to apply for West Central Railway Vacancy 2017 can fill application form for Apprentice Posts. Candidate who wan to fill application for WCR RRC Bhopal jobs should apply latest by 20th December 2017. Candidates who are looking for WCR Jabalpur Region Vacancy, here is a good news for you. West Central Railway has recently released 322 Ticket Collector, Loco Pilot, Clerk & Other Vacancy. Candidates who are interested in West Central Railway Recruitment 2016 – 17 can fill online application before the last date. Closing date for submit he WCR Ticket Collector Online Form is 30.12.2016. West Central Railway (WCR) is inviting online application for those candidates who are looking for Jabalpur WCR Jobs 2016. This is a great opportunity for all the candidates who are waiting for West Central Railway Vacancy 2016 – 17. Eligible candidates can fill WCR Loco Pilot Vacancy Online Form on or before the last date. For more details about West Central Railway Recruitment 2016 –17 check given below details. Junior Engineer Vacancy : Candidates should have done 03 years full time Diploma in respective trade from recognized University for Jabalpur WCR Recruitment 2016 – 17. For Ticket Collector & Clerk Vacancy : HSC/12th or equivalent qualification with minimum 50% Marks is required for applying West Central railway Ticket Collector Vacancy 2016 –17. For Other Vacancy : Applicants must have done Matriculation + ITI Course in related stream from authorized Institute for WCR Loco Pilot Jobs 2016 or Jabalpur RRC Technician Vacancy. Age Limit For WCR Recruitment 2016 – 17 : Age of the candidates for WCR Recruitment 2016 – 17 should be not more than 42 years. Age relaxation is applicable up to 03 years for OBC Category & 05 years for SC/ST/PWD Category candidates for West Central Railway Recruitment 2016 – 17. WCR Technician Vacancy 2016 Cost of Application : There is no need to pay any application fee for West Central Railway Vacancy/ RRC WCR Jobs. Junior Engineer Jobs : Candidates will be paid Rs. 9,300/- to 34,800/- with Grade Pay Rs. 4,200/- for WCR Jabalpur Region Requirement. For WCR Ticket Collector Vacancy : Rs. 5,200/- to 20,200/- + Grade Pay Rs. 2,000/- will be paid for West Central railway Ticket Collector Jobs 2016 –17. For Remaining Jobs : Selected candidates for RRC Jabalpur Jobs will be paid pay band Rs. 5,200/ – to 20,200/- + GP Rs. 1,900/-. West Central Railway Jobs Selection Process : Selection of the candidates for West Central Railway Recruitment 2016 – 17 will be on the basis of Written Exam followed by Documents Verification. First of all visit to the official website. After that click on official WCR Vacancy Notification. Fill all the details in Jabalpur WCR Online form without any mistake. Upload your Scanned photo & required documents carefully. Recheck all details & Click on proceed button. Than send the hard copy of application with required documents on correct postal address. Download RRC West Central Railway Asst Loco Pilot Syllabus. West Central railway Recruitment 2016 – 17 For 322 ticket Collector, Technician & Other Vacancy. Candidates should apply online application for WCR Loco Pilot Jobs or Jabalpur WCR Technician Job son or before the last date 30.12.2016.